I have made a few references to the fact that I'm leaving fair Toronto and moving to the San Francisco Bay area to take advantage of an opportunity that as a family, we couldn't pass up. When this opportunity came along, I wasn't ready to move. Not even close. Early on, I decided that the move would happen gradually over almost two years. This seemed like the only way to make it manageable. I've been quiet on the blog lately while trying to see as many people as possible and finish off everything at work and at home before leaving. In short, it's been hard. My stress levels are high and I've had almost no time for the things in life that make me happy and give me balance. 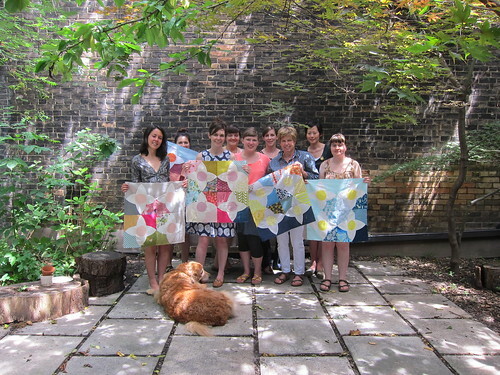 After being in the office every single day for a week after my "official" end date, I decided that the only way to avoid spending my very last week in Toronto working 12 hours a day was to sign up for the world's most awesome four day quilting class with Lizzy House. Yep, you read that right, Lizzy freakin' House. Easy choice. I'm not sure that I can put into words what it meant to me to spend four days with Lizzy and the wonderful group of women in my class at this stage of the game. Suffice to say that it was amazing enough that I actually cried on the last day...on and off for almost an hour (could also be related to the whole moving/saying goodbye thing). Things kicked off with Lizzy's help picking and organizing our fabrics. The next three days were all about getting down to business pressing, cutting and sewing our blocks together. It took me all four days to make it about 1/3 of the way through the cutting and to get one block pieced. Amazing, right? I really love how this is coming along. 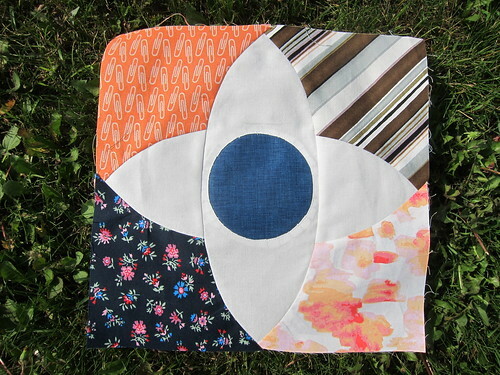 Every part of this quilt is beautiful...even the scraps it generates. Let's just say that this puppy is going to be a lot of work. The kind of work that bends your brain, makes you hesitate and double check everything before you cut into your fabric and that makes it tough to see the beautiful quilt at the end of the tunnel. Not so different from our move, except at the end of the move there is an exciting new life waiting for us in place of a lovely quilt. In light of this parallel, it seems appropriate to tackle this quilt on the four week Farewell Canada tour we hatched (no better way to elevate a busy move to truly crazy status). Me, the Mr. and our dog are driving across Canada and down the West Coast until we make it to California. Along the way, we are stopping to spend time with almost everyone that we love and even found a little time for some much needed R&R. I'm hoping to grow this quilt throughout our journey, making a block a day so that when I arrive in the Bay area, I'll have a gorgeous quilt top to remind me that difficult things can also be beautiful. We too are moving countries, so I know something of your struggles. How great to have a quilt to commemorate the move, slightly tricky pieces coming together to make a beautiful whole. All the best as you finish off, look forward to hearing about it periodically here. I so desperately wanted to take this course!! I didn't want to do it alone though, dang i wish i had of know you'd be there, it would have been awesome to meet in person! Your block looks fantastic and i can't wait to see the progress you make on your Farewell Canada tour! That quilt will be worth it, wow! And I'm sure the move will be too! Hang in there. And on the bright side, the internet quilting world will be exactly the same on the West Coast!! What a gorgeous pattern! I love the contrast between the apricots and the blues and can't wait to see more of your progress. Would you be interested in uploading this as a work in progress on Kollabora, the crafting community? 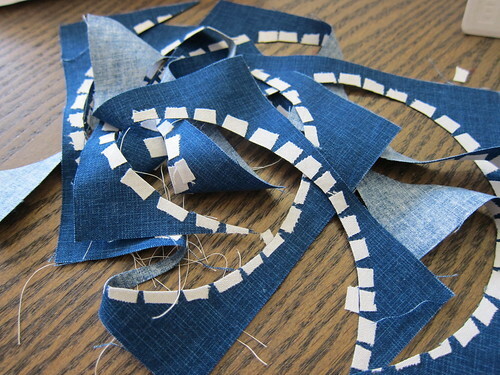 We've been looking for quilting inspiration lately.